Having not payed much attention to some of the more esoteric research directions in recent years, could you give us an impression about any progress people might have made? Are the foundational problems plaguing say, LQG more or less the same as they were this time ten years ago or have they gotten some of them under control? Did you hear Renate Loll's talk and what do you think about their approach? Renate Loll's (and coworkers) approach is quite interesting and they have obtained impressive results. As always, her talk was very enjoyable, but I could not say that I remember hearing anything I did not hear before (same as for most of the other talks). Their approach shares the problem of controlling the large scale, classical limit of the theory. In particular, as they treat time and space directions differently in their measure (which is a feature rather than a bug of their approach) it is not guaranteed that they obtain a Lorentz invariant theory in the continuum limit. They could share the fate of Horava gravity in having one of the many IR fixed points without that symmetry and thus be in conflict with classical gravity. In a discussion Renate agreed with this assessment but pointed out that it is non-trivial to formulate this question in concrete form in their formalism to be tested for example numerically. Re Anonymous1: I don't know which foundational problems you refer to in particular. 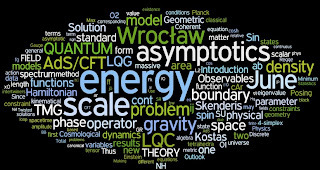 My impression is rather that many problems are avoided by not anymore working in old school loop quantum gravity any more but with all kinds of more or less related other approaches (BF, spin foams, loop cosmology etc). Robert, it seems to me that you are less critical now of 'alternative' theories than in previous years. Your own talk did not end with 'and therefore lqg quantization is wrong', but seems to leave it up to the audience to decide if alternative quantization of 2d gravity makes sense. How did you get that impression? I thought my critical attitude was expressed in this post. And what did you expect? I would never say a thing like "your approach is wrong", not in public nor in a personal conversation. I would say things like "I am skeptic" or "there might be an issue with..." but I think everybody should be able to form their own opinion. Not all string theory bloggers have the same apodictic style. 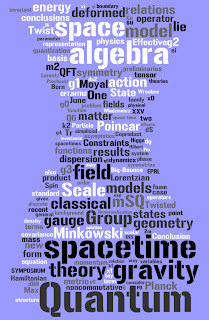 In the case of the LQG string, I think my statement is clear: Restricting to invariant states is not physically justified as demonstrated by the Fock space Gupta-Bleuler style quantization of the string. This sheds serious doubts on the inevitability of discontinuities that I would say plague the loop approach and for example lead to ad hoc choices in the discretization of the analogue of the Hubble equation in the loop inspired approach to cosmology. BTW I very much prefer to talk and discuss with people that do have a name. I think NC geometry is a misnomer. NC geometry defines a NC *-algebra rather than a spacetime geometry. 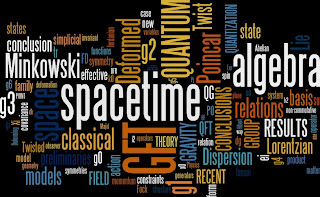 The spacetime geometry should be derived from the underlying NC *-algebra in the sense of emergent spacetime (or gravity). This is also true for a NC field theory. NOT a tensor breaking Lorentz symmery. The Lorentz symmetry should be addressed from the geometry side which is derived from the algebra side. Then the Lorentz symmetry breaking due to a noncommutative spacetime is a fallacy since we are still stick to the conventional spacetime picture rather than an emergent spacetime. I think Piacitelli's interpretation is compatible with the emergent spacetime picture from NC geometry.